This Deep Chocolate Zebra Cake is a winner for all the chocoholics in your life! Rich and totally satisfying, one slice is all you need, but you may just have to go back for seconds LOL. 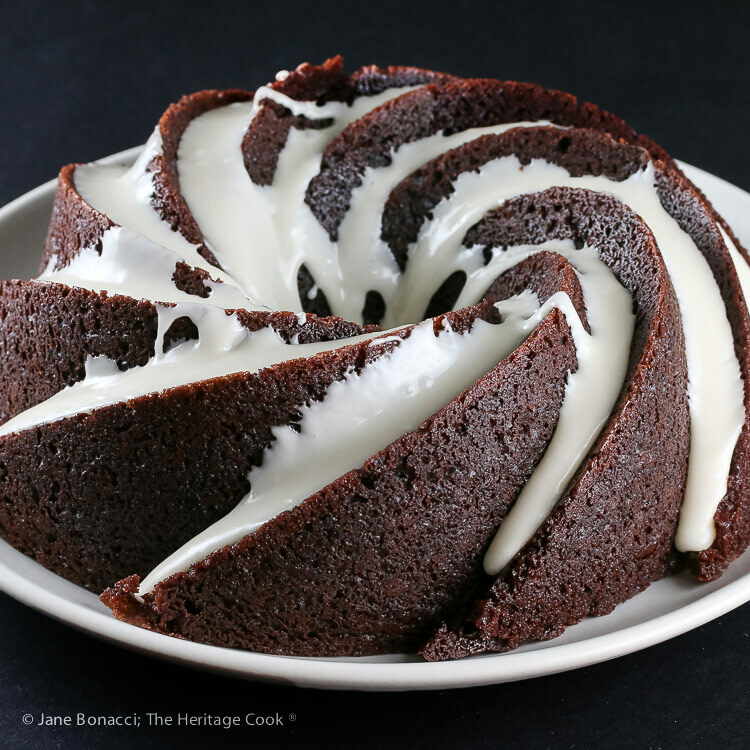 Bundt cakes have always been a favorite in The Artist’s family. His mom would make them for both his brother and his birthdays each year. He still loves them and is always excited when I tell him that I’m making one for Chocolate Monday! This is the perfect choice for your family and friends who prefer less sweet cakes. It is packed with chocolate flavor in every bite but it not overly sugary. What makes this cake so visually stunning is the vanilla glaze. It adds a lovely creaminess to every bite and also balances the flavors, adding the perfect amount of sweetness to complement the depth of chocolate in the cake. One thing that is a surprise in this cake is using 1 tablespoon, yes a full tablespoon of baking soda! This is not a typo and my cake did not overflow the pan but I did have it sitting over a baking sheet just in case. The Artist and I loved this tender, delicate Deep Chocolate Zebra Cake, fully satisfied with just one slice each. Although I really wanted to go back for seconds, LOL. Have a wonderful Chocolate Monday and week ahead! I used my regular favorite gluten-free flour blend LINK in this cake and we loved how delicate and tender the crumb was. Preheat the oven to 350°F with the racks in the lower third. Butter a 12-cup bundt pan. Prepare the Cake: In a saucepan, set a medium heatproof bowl over simmering water. Add the chocolate to the bowl and melt over med-low heat, stirring often. Remove from the heat and carefully set the bowl aside. Let cool slightly. In a bowl, whisk the flour, cocoa powder, baking soda and salt together. In a 4-cup measuring cup, whisk together the egg, buttermilk, milk, and vanilla. Pour the melted chocolate into the bowl of your stand mixer. Add the oil and sugar and mix until smooth. Add half of the dry ingredients plus half of the liquids; mix just until smooth. Add the remaining dry ingredients and liquids, mixing until smooth. Pour the batter into the prepared pan and bake in the lower third of the oven for about 45 minutes, or until a toothpick inserted in the center of the cake ring comes out with a few moist crumbs attached. Let the cake cool on a rack in the pan for 10 minutes, then invert it onto the rack, remove the pan, and let it cool completely. Make the Vanilla Glaze: In a bowl, whisk together the ingredients until smooth. If too thick, add a touch more milk (1/2 tsp at a time) and if too thin, add more sugar. Set the cooled cake on a serving plate or platter. Pour the ganache over the top and let it drip down the sides. Let the cake stand until the glaze is set, at least 15 minutes, before slicing and serving. I would love to see the pan you use for this lovely cake. It came out so perfectly! I’ve seen silicone bundt pans lately and wondered about them. Hi Shannon – I found the pan listed in the King Arthur Flour catalog and I’m sure you could find it on Amazon. It looks exactly like the cake. I do butter the pan before filling with the batter so it will release beautifully. Hope you have a chance to get one!